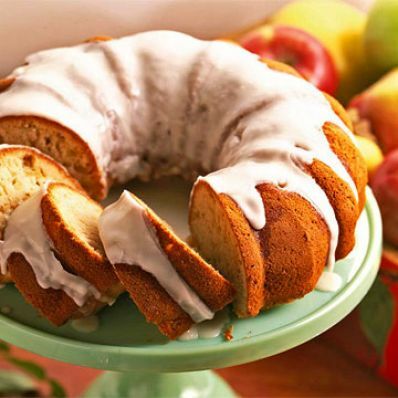 1 of 1 Heat oven to 350 degrees F. Coat 10-inch bundt pan with nonstick cooking spray. 1 of 3 Sift flour, baking powder, salt, baking soda, cinnamon, nutmeg and cloves into medium-size bowl. 2 of 3 Beat together butter and sugar in second medium-size bowl on medium-high speed until smooth and creamy, about 2 minutes. Add eggs, one at a time, beating well after each addition. Beat in sour cream and applesauce; mixture may look curdled. On low speed, slowly add flour mixture, beating until well blended. Gently fold in apple pieces. Scrape batter into prepared pan, smoothing top. 3 of 3 Bake in 350 degrees F oven for about 50 minutes or until cake tester inserted in center of cake comes out clean. 1 of 2 Meanwhile, heat together sugar, apple juice and brandy in small saucepan over medium-low heat until sugar dissolves; do not boil. Remove from heat. 2 of 2 Remove cake from oven. Leave cake in pan; place pan on wire rack. Brush top of cake with half the brandy syrup. Let stand 10 minutes. Invert onto wire rack and remove pan; place rack over jelly-roll pan. Brush cake with remaining syrup; let cool completely. 1 of 1 Mix sugar, juice and nutmeg in small bowl until smooth. Drizzle over cake. Let harden slightly.